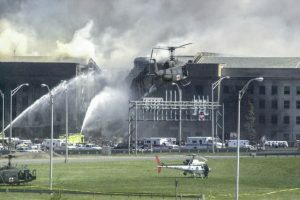 Anne Skelly will never forget one of the most harrowing days of her career — working inside the Pentagon when Flight 77 hit the building. At the time, she was an Air Force major and a speechwriter for Secretary of Defense Donald Rumsfeld, as well as Deputy Secretary of Defense Paul Wolfowitz. Anne says she heard the sound of sirens almost immediately after Flight 77 crashed into the Pentagon on 9/11. Here helicopters land to evacuate casualties. The day after the attacks, Anne, along with all uninjured Pentagon staff, demonstrated resilience by returning to work. The smell of jet fuel still lingered in the hallways. To help give hope to the shocked nation, Anne relied on storytelling, bringing hero stories to life. 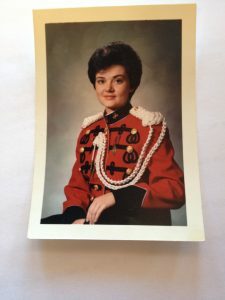 Anne wore this dress uniform on special occasions during her days promoting the U.S. Marine Band. Anne spent more than two decades in the government defense arena. Her career began with a public affairs position in “The President’s Own” U.S. Marine Band. That job led to the Air Force and various other roles until she eventually became a speechwriter. For the past 10 years, Anne has worked for oil company Chevron, starting as a speechwriter before taking on her current role as senior communications advisor, supporting employee communications for a senior executive. 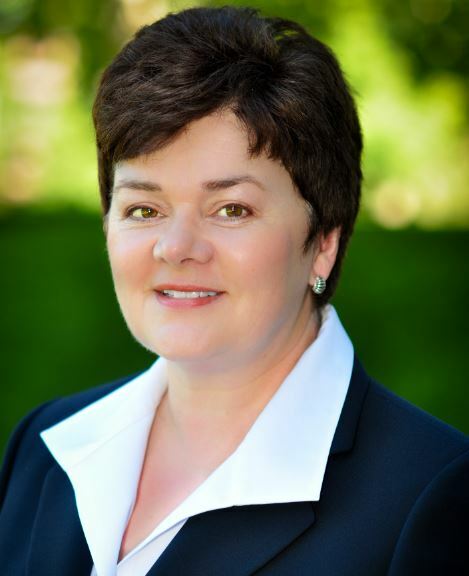 She joined IABC about 20 years ago while working as an Air Force captain and speechwriter. At the time, she was crafting communications for a four-star general in charge of the Air Force’s heavy bombers and fighter aircraft units. One address, titled “The Spirit of Kansas,” celebrated the addition of a new B-2 bomber to the fleet in 1996. IABC Richmond, Virginia, presented her with a “Best in Virginia” award that year for best speech. Want to be featured this month for Member Month? Or know another member with a great story? Let us know. Send an email to Julie Knight, editorial director. Learn why October is a great month to join or rejoin. Share what you love about IABC. Post to your social networks, using the hashtag #WhyILoveIABC. Julie Knight is an award-winning, accredited business communicator and storyteller. Her clients have included The Walt Disney Company, Starbucks, Cisco Systems, Genentech, McKesson Corporation, Clorox and Hewlett-Packard, to name a few. Connect with Julie on LinkedIn or missionpossible.strikingly.com. Thanks for a great profile by Julie Knight of SF IABC member Anne Skelly. I met Anne at a Networking Nine dinner event several months ago in Walnut Creek, and loved sharing the meal with her. A favorite line in Julie’s profile (in addition to learning about Anne’s impressive communications and military service background) is her simple and excellent advice: “not to over-embellish hero stories and let the facts and — whenever possible — the service members speak for themselves.” If only more “hero stories” did just that! Thanks for the lovely profile on Anne, a good colleague of mine at Chevron. She has a most impressive career history, and always has such great stories to tell. Anne is an incredible writer, as well, with an extraordinary knack for research and personalizing everything she writes, no matter who it is for. I am so glad that she is here to be able to tell her 9-11 story. I agree wholeheartedly with Molly Walker’s review of this member profile written by SF IABC member Julie Knight about SF IABC member Anne Skelly. I especially like that Julie’s article is illustrative of Anne’s advice to “let the facts and…[others] speak for themselves” when telling a story. The article is also a great marriage of graphics and text.